On my quest for better health, one of the bits of advice that I kept seeing over and over again was to try and make everything at home, even junk food. Even though it’s still bad for you, it’s easier to feel good about satisfying a craving when you know exactly what you’re getting! After some extra training in summoning, I have found my homemade alternatives actually work quite well for some cravings! 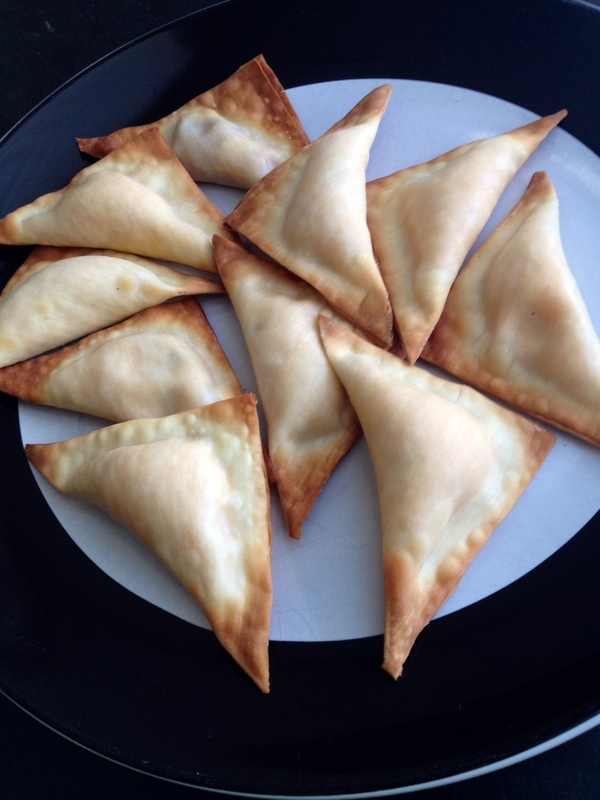 One of my favorite homemade doppelgangers is a rangoon recipe I made to replace an old favorite: crab rangoon. The challenges of making it both tasty and less unhealthy were not insignificant! First, I had to overcome the lack of crab flavor (not that I think there was actually much crab in the ones I’d get from the takeaway near the Mage’s College!). Second, I needed to duplicate the creaminess of cream cheese and other wonderful/terrible ingredients to make them a bit healthier. Third, I would need to find a way around frying. The first and second challenges were interesting questions to be overcome, but the third, that was the trouble- it couldn’t be fried, but crispy was non-negotiable! A long time ago, I was cursed by an evil wizard…I mean, these things happen all the time, and it’s not usually a terrible inconvenience, but it does prevent me from frying foods. Since receiving my curse, I’ve tried deep frying things three times. Each time, I have destroyed a kitchen utensil and burned myself, usually badly. I’ve learned to take curses seriously, and I’ve learned to work around my inability to deep fry things. The curse is probably better for my health in the long run given how much I love fried foods, but it gets in the way when you’re craving a fried snack! As for flavor and creaminess? I was surprised with the versatility of vegan cream cheese and vegan mayo, and how they combined to be just thick enough and just smooth enough to make a great filling! I tried more complicated solutions, but actually prefer how simple these wound up being- some garlic powder and green onions are all it takes to carry the flavor! Sriracha livens up the whole snack, making it just a tiny bit spicy and just slightly pink! So while this spell initially had a lot of moving parts, I knew from the start what I was after! I wanted crispy and savory and a little spicy, but creamy and delicious on the inside…. After lots of research (read: eating a lot of them) and playing around with vegan substitutes, here’s a recipe that can be tweaked and varied to accommodate tastes, but always satisfies my need for the real thing! Preheat oven to 350*, spray a baking sheet with cooking spray. Combine cream cheese, mayo, sriracha, green onion, and garlic powder in a small bowl. Place a small amount of the filling in the center of each wonton, seal shut with water so that they form triangles. If they can’t close without squirting out filling, use a smaller amount of filling on the next one! Arrange the triangles into a single layer on the greased baking sheet, and then spray the tops of each triangle with cooking spray or olive oil. Bake 13-15 minutes until browned. Serve hot! This entry was posted in comfort food, simple and satisfying, snack and tagged comfort food, DIY, healthy-ish, junk food. Bookmark the permalink. I am so glad! I figured there are enough health and wellness blogs, and that perhaps a little magic would spice up good food more than statistics! 🙂 Thanks for reading! Sorry for the difficulty, but thank you!! And thanks for reading! it, you will be a great author.I will ensure that I bookmark your blog and will come back down the road.